The membership of the Michigan Economic Developers Association have re-elected Ara Topouzian, president and CEO of the Troy Chamber of Commerce, to its board of directors. Topouzian has also been appointed as president for 2014 after serving as vice president in 2013 and treasurer in 2012. Topouzian is responsible for overseeing one of Oakland County’s strongest Chambers with more than 700 members, as well as expanding the Chamber’s role as a champion for small and large businesses. A strategic leader experienced in both private and public industry sectors, Ara is accomplished in the field of economic development for municipalities. He has a successful track record in attracting international corporations as well as retaining small and large businesses to the area. His proven abilities in marketing, leadership and operations have made him a creative thinker and problem solver who consistently delivers business growth and development for entities represented. He is also skilled in association management and membership development. He has presented, moderated and facilitated small and large groups, including service organizations, colleges, libraries, associations and more. 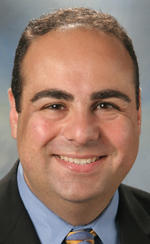 For more than six years, Topouzian was the economic development director for the city of Novi. During his tenure, he was responsible for business attraction projects valued in excess of $100 million in investment. Other notable accomplishments include being president of the Farmington/Farmington Hills Chamber of Commerce (2000-2009), being awarded as Kresge Artist Fellow of Performing Arts (2012), and receiving the Mike Conboy Economic Development Award from MEDA (2013). His professional education includes a Bachelor of Arts in Journalism from Wayne State University as well as attending the Trinity of Management – Sirolli Institute, Small Business mentorship program. The Michigan Economic Developers Association has been the leading voice of economic development in Michigan for over 50 years. Consisting of members who strive to build and retain business in Michigan, MEDA makes it possible for professionals to do their job more effectively and efficiently. We look forward to seeing Ara help strengthen and continue to build our Association.